Piercing Javelin is a common Willpower action card. It is part of the Core Set. In addition to the card's availability in the Core Set, three copies are included in the Alduin's Apocalypse theme deck, three copies in the Ancano's Cunning theme deck, two copies in the Band of Survivors deck, two copies in the Hlaalu Schemes theme deck, two copies in the Tribunal Glory theme deck, and one copy in the Imperial Might deck. The card's image depicts a scene from ESO: The ability of the same name, wielded by an Altmer clad in the armor of his race, while its alternate art depicts a Winged Twilight being destroyed by the same ability. 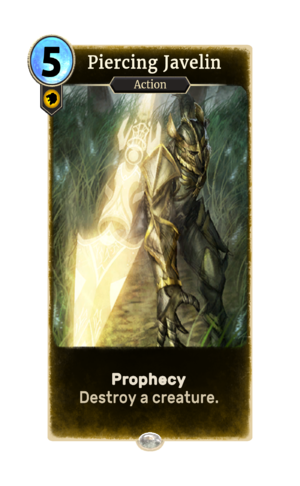 The card was renamed from Burning Light (also a skill in ESO) during the open beta period. Alternate-art versions of the card were given as a reward for entry in the July 2017 and March 2018 Grand Melees.